We have 6 more Hump Night shows before we take a break for the summer and I’d love to find a couple of interns to help out with the show. I’m looking for people to help by taking photos, posting to our social media and looking for ways to improve the overall experience for our audience. We only have 6 shows left, so it’s not a long commitment. If you’d like to also take the upcoming Game of the Scene class or summer Improv Boot Camp for free that can be arranged or just do it to help out with the show. We can use the help! Just fill in the form below and I’ll get back to you as soon as I can (answering the question is optional). Please share this with your friends if you know of someone who might be interested. Why would you like to intern for Hump Night? Some photos from last week’s Hump Night. Tonight’s show will be the last Hump Night of the summer. We return in September. More details to come. Last Hump Night of the Summer! This is the last Hump Night of the summer. We won’t be back until September so be sure to come down and check us out. Thanks! Hump Night returns this week with another great lineup of standup, improv, music, and storytelling. 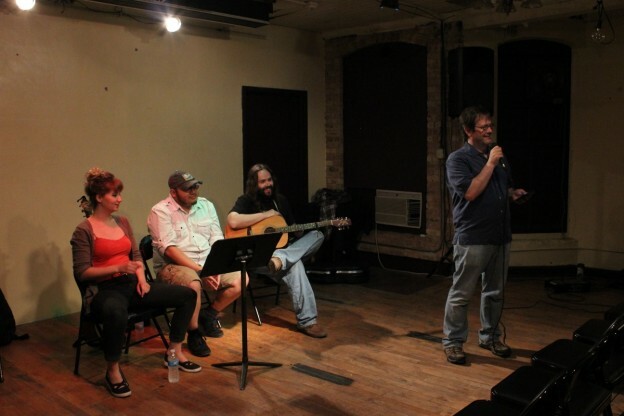 Standup, storytelling, music, sketch and occasionally some improv. Author mullaneyPosted on July 22, 2013 July 23, 2013 Categories hump night, improvTags Alison Gates, Amrita Dhaliwal, Colleen Doyle, Collin Bullock, Delicately Seasoned, Don Hall, Lindsay Williams, Mullaney Chain, Pancakes Tonight!, Richard and the Kids, Sad BananaLeave a comment on Last Hump Night of the Summer! Kevin invites a great improvisor to play, who invites a third, who invites a fourth who invites one more. Here is some of what you missed from last week’s Hump Night. Make sure to be there tomorrow night to see Saurin Choksi and Honeybuns! Alex Frenkel & Danielle Bluford from Pancakes Tonight! Most of these photos were taken by Oopey Mason. Five months ago, I started a variety show called Hump Night. If you follow me, you’ve probably heard about it. You may have come to see it once or twice. Maybe you have even performed at Hump Night. Well, if you like Hump Night, if you have been getting something out of it, I could use a little help. The deal I have with Strawdog is pretty good. They don’t charge me upfront for the space. Instead, they have a bar in the back of the room. They have a certain minimum that they’d like the bar to make and if they don’t reach that, then I have to make up the difference. Many times, that hasn’t been a problem. Between the donations and the bar, I haven’t had to pay a lot each week. And in the beginning, the students who were performing were essentially subsidizing the rest of the night. I was using part of the money from their tuition to pay for the space. However, some nights it has cost a lot to run the show. Sometimes we don’t sell much at the bar and we don’t take enough in donations and I end up spending more to keep Hump Night going, then I earn for coaching the teams that perform there. So there are a few things I could do. I could search for another venue, one that would be less expensive. There are not a lot of venues out there that are as nice as Strawdog and less expensive though. Plus I do really like the location. I could try to charge for the show. But I really prefer the donation model for this show. I could do better at promoting the show. This is true and I’m working on it. It’s a challenge to get people there and I’m constantly trying to figure out the most time-effective ways to get the word out. I could close the show. This is an option. I currently have extended the show through July, and if I can’t figure out a way to support the show, this is the likely outcome. So what can you do? Maybe you perform at Hump Night, maybe you have come to see some shows. If you get something out of the show and you want to see it continue past July, there are some things you can do. When you come see the show, have a beer or two. Every dollar you spend at the bar is as good as throwing a dollar into the bucket. If you don’t drink, please put a few dollars in the bucket. If you perform, try to recruit one or two people to come each week. The thing is with the number of people participating in Hump Night in some fashion it shouldn’t be hard to make enough to keep it going. And I don’t mind pitching in a few bucks myself. I think though, if I’m asking for money so directly, I’m going to take a leap here myself. It’s a small one, but I’m going to change how the donations work. I think people aren’t really sure what happens to the donations and so they are a little reluctant to give. So every show, I’m going to give half the donations to the performers in the Variety Hour. It probably won’t be a huge amount, but I have a hunch that if I give away half, the audience will be more apt to throw some money in the bucket. And this new policy starts tonight. See you at Hump Night! PAY WHAT YOU WANT – Donations appreciated. 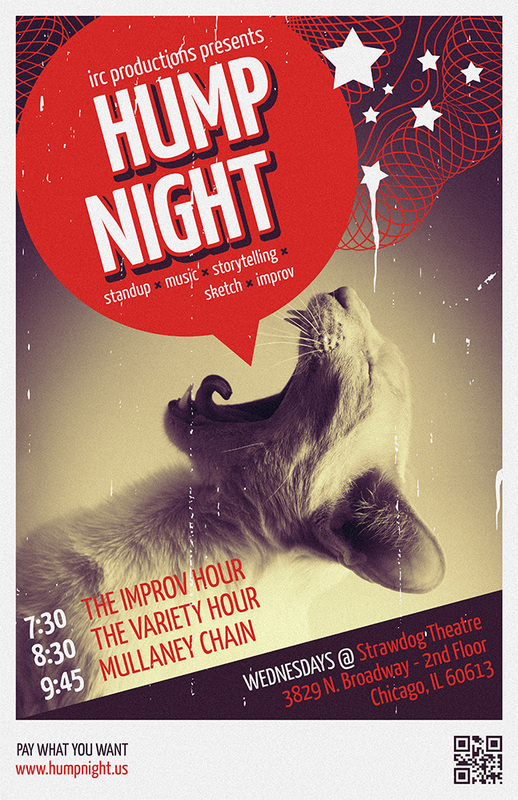 Hump Night is back again this week with another stellar lineup of standup, improv, music, and storytelling.